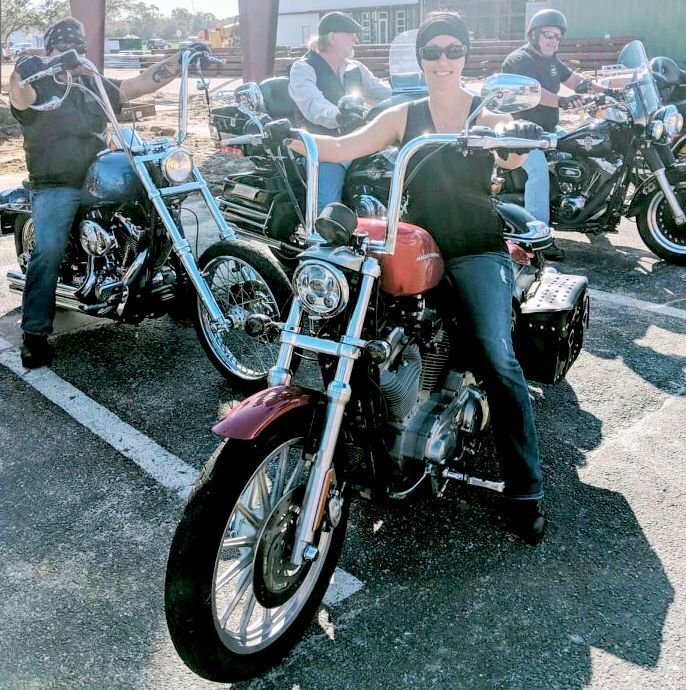 Nicole Swanson lines up to go to bars co-sponsoring the poker run including Chubby’z Sports Tavern & Grill, Gatorz Bar and Grill, Hawgz and Dawgz before returning to Bert’s Black Widow Harley-Davidson during the recent poker run. Jim O’Brien checks out the group of motorcycle riders as they leave to go on the recent poker run at Bert’s Black Widow Harley-Davidson. Captain Jim O'Brien, right, speaks to a bike rider before the poker run. Joe “Wildman” Hutchinson and his bird Sweet Pea check in after the poker run. Naomi Conrad picks a card after the poker run. Debbie O'Brien counts the money from the poker run fundraiser sponsored by her husband Jim, founder of Fish'n for Heroes. Jim O'Brien speaks to Elizabeth Brown, the marketing manager at Bert's Harley-Davidson, about next year's poker run. Tonya and Rick Cintron enjoy the ride. ENGLEWOOD — Last summer, when red tide hit, Jim O’Brien knew he couldn’t take veterans out fishing in the Gulf of Mexico. That hasn’t stopped the charter captain from raising money to bring even more wounded vets out this year. Back in 2012, O’Brien founded a nonprofit foundation Fishin’ for Heroes Wounded Warriors Inc. Over the years, he’s taken about 275 wounded veterans on fishing trips. “I take a group of six out about 30 miles off shore of Stump Pass in Englewood,” O’Brien said. “The veterans fish. We furnish the license, bait and tackle. We then clean and bag the fish. It’s brought to Snooks Bayside Bar & Grille. The vets eat what they catch that day. What’s left over is packed in ice. The drinks and side dishes are included at no cost to them.” Now he’s looking for more veterans for a future ride. He hosted his chili cook-off on West Dearborn Street that raised about $3,500. O’Brien is always looking for new fundraisers to sponsor the veterans for a day on the water, fishing, relaxing and meeting others who served in the military. He went to Bert’s Black Widow Harley-Davidson a few months ago and asked if they’d be interested in helping his cause. “Not only did they say yes, they donated money back from the $20 entry fee and made up flyers for us to help promote a poker run,” O’Brien said. The ride was held Feb. 2. 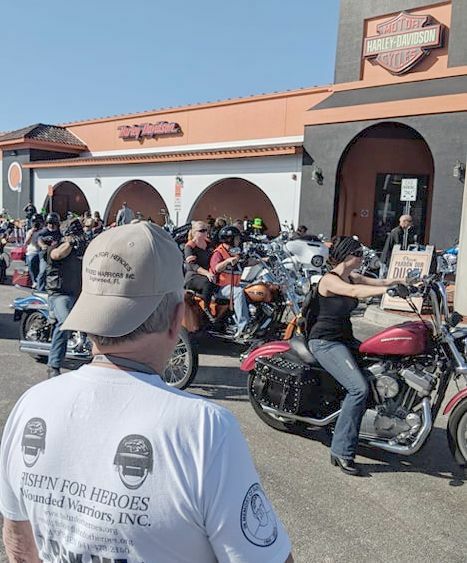 About 47 riders visited bars in Punta Gorda and Port Charlotte before returning back to Bert’s Harley-Davidson. The winners were Kimberly Workman, who won first place of $200. The $75 second-place winners won by three people, Nick Lorenzo, Gary Casterlin and Shawn Wenderlin. Third place was won by three including Shawn Thompson, John Hodge, George Schwarz, who each received $25. O’Brien raised more than $1,000 through the poker run. O’Brien said he met so many new riders during the event he will easily be able to attract more than 100 next year. Now he’s volunteering with two car show organizers who are helping him raise more money. One big show is planned by the Venice FL Chapter AACA Club on March 31. Another car show and golf tournament is planned April 13 at Rotonda Golf & Country Club’s Long Marsh Golf Club. On May 12, O’Brien is working with the Port Charlotte Florida West Coast Car Club for another car show.